During the spring, summer and fall most of the vegetables that appear on our table come from the farmers' market. It isn't that I don't like the grocery store—some things (artichokes or fava beans, for example) are only available to me where I live (in the Midwestern U.S.) through the grocery store. It's just that I love the immediacy of the market...not to mention the fact that I get to interact with the people who actually grew the food. So, throughout the growing season, if I am in town on Saturday morning, I make the trek to Kansas City's City Market and bring home enough vegetables for a week. It is always a relief and a pleasure when my produce bin begins to fill up with the local bounty of the season. It is early in the growing season, so I am not yet at full reliance on the market for the year...but I am well on my way. Already we have been enjoying radishes, beets, asparagus, greens (especially kale, arugula and beet greens) and spring onions. 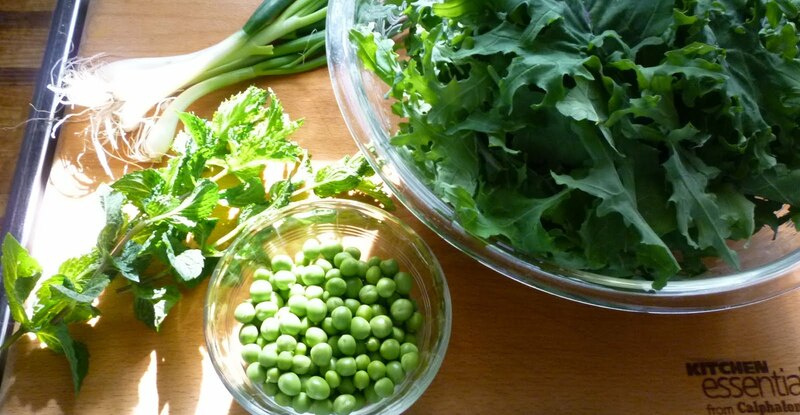 Recently I made a freekeh pilaf for our evening meal inspired by...and featuring...some beautiful young Red Russian Kale and the beginnings of the spring onion crop that I picked up at my farmers' market. 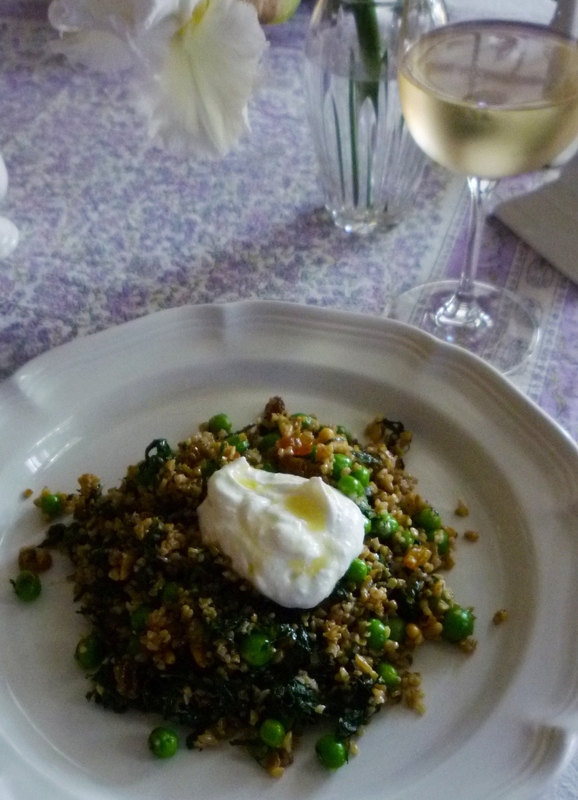 I augmented these market finds with fresh shelling peas from the grocery store...and mint from my garden. I don't know whether it is most accurate to call this pilaf a variation of the Bulgur pilaf with Spinach and Chickpeas (posted almost exactly five years ago)....or an embellished version of the simple freekah pilaf found in Ottolenghi's Plenty... Perhaps it would be more accurate to say it is a blending of the two... Certainly they were both part of the inspiration. In any case, it was delicious. 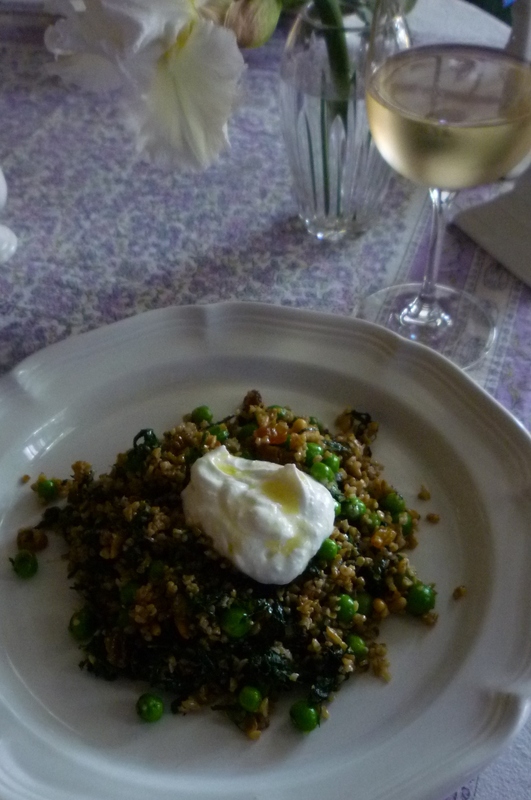 I served it with a dollop of labneh....but a scattering of crumbled goat cheese would be good too. If you wanted something more substantial, it would be delicious with a poached egg on top. As my pilaf's origins suggest, all kinds of variations are possible. The kale could be replaced with cooked spinach...or beet greens...or chard (this time of year the array of available greens is broad)...and the peas could be replaced with any of the delicious green vegetables at their peak right now. 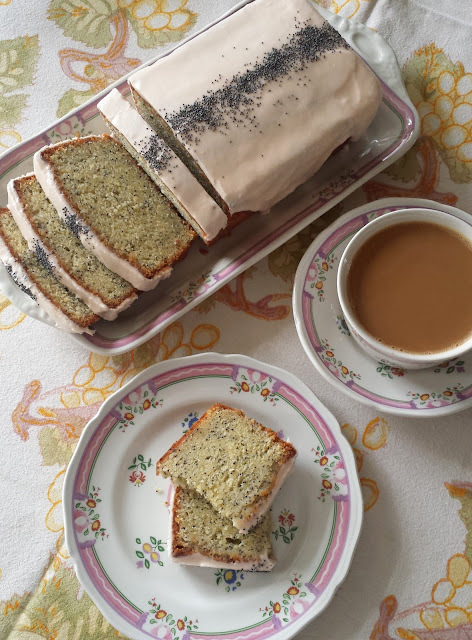 Asparagus is the first thing that comes to mind, but if you live in an area where artichokes and fava beans flourish, they would be good too. In general, I find that pilafs make a great backdrop for the vegetables of early spring. They are light enough to feel appropriate on a warm spring day...and yet still have enough substance to sustain if the weather happens to take a cool turn. If you haven't incorporated them into your rotation of regular favorites, I encourage you to do so. But mostly, I encourage you to explore your farmers' market and begin to rely more and more on the bounty of your region to supply your table for as much of the year as you possibly can. Bring a large pot of salted water to a boil. Add the peas and cook until tender—1 or 2 minutes. Scoop out using and refresh under cold running water. Set aside. Drop the kale into the same pot of water and cook until just tender. Drain and spread on a baking sheet. When cool enough to handle, squeeze out the excess liquid one handful at a time. Roughly chop and set aside. Melt the butter and 1/2 T. of the olive oil in a heavy-bottomed pot set over medium heat. Add the onions and stir to coat in the fat. Sweat, stirring occasionally, until the onion is soft and translucent—about 5 minutes. Increase the heat to medium high and add the drained freekeh along with the spices and a generous pinch of salt. Continue to cook for a minute until the grains are coated in the oil and sizzling in the hot oil. Add the stock and bring to a full boil. Reduce the heat to the lowest setting and cook, covered until the freekeh is tender—20 to 25 minutes. 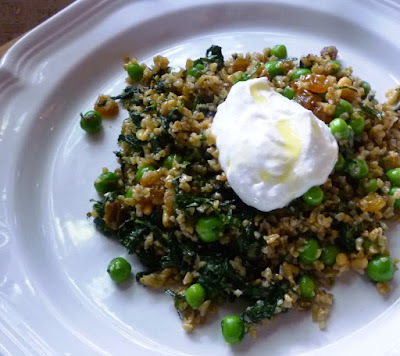 Remove from the heat and scatter the golden raisins over the surface of the freekeh. Cover and let rest for 5 minutes. 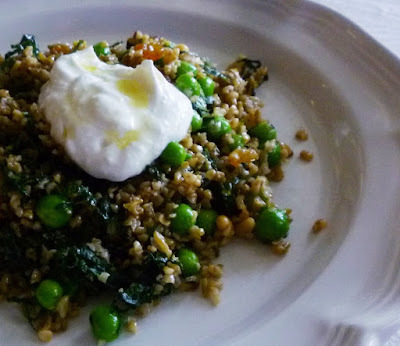 While the freekeh rests, heat a tablespoon or so of olive oil in a wide sauté pan set over medium heat. Add the garlic and pepper flakes and cook until the garlic begins to sizzle and is fragrant. Add the kale, season with salt and continue to cook and stir until the kale is hot through. Transfer the freekeh and raisins to a large bowl. Add the warm kale followed by the mint, peas and pine nuts. Toss until everything is well combined. Serve with a dollop of labneh and a drizzle of olive oil if you like. Serves 2 generously as an entrée. Note: Recipe is easily multiplied.